Chips // salt and vinegar are my absolute fave! Fries // if you have never tried Costco fries, where have you been?! You are missing out on the world’s crispiest fries! On the other hand, a crunchy food I never restrict myself of is GRANOLA. If you were wondering, the apron I am wearing is fair trade and hand block-printed in India. It is available at Pure Art, a fair trade shop in Hudson, Quebec. 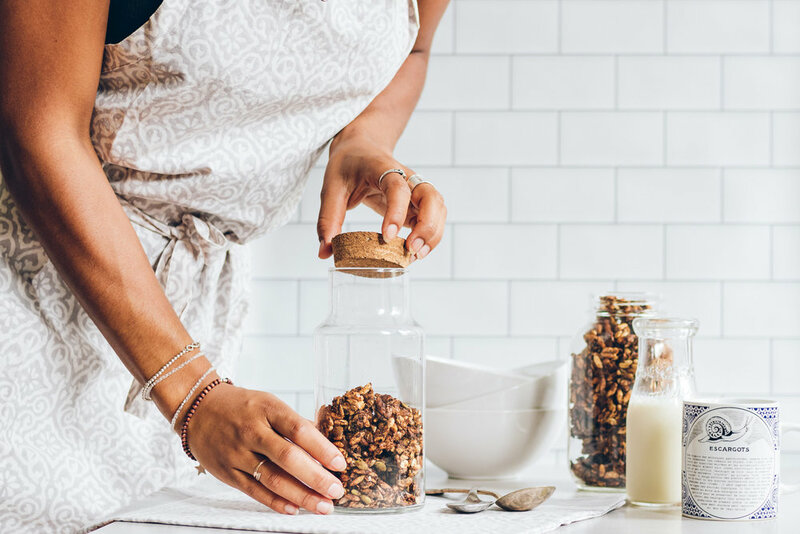 I love the fact that granola is super crunchy, can be enjoyed on its own and with milk, is super nutritious and has full of nuts – I mean who can resist the decadence of nuts! Lately, you might have noticed that I have been trying to reduce the amount of processed sugar I eat. I have been replacing white sugar, brown sugar, coconut sugar and even maple syrup with dates. Unfortunately, in a recipe you cannot simply swap out let’s say a cup of sugar with a cup of dates without affecting the texture of your food. That is why I am here: to share with you some healthy, sugar free alternatives to your favorite recipes. I already have a number of sugar free recipes on my blog, but I thought that you’d love an alternative to traditional maple syrup or coconut sugar-sweetened granola. That is how this crunchy, sugar free granola came to life! For the base of this recipe, I used old fashioned oats + puffed brown rice. I had tried to add puffed rice to a batch of granola in the past and absolutely looooved the crunchiness it added so I thought it’d be a perfect addition to this granola recipe. Also, because I had looooots of seeds and seed butter in my pantry, I made this granola 100% nut free. However, if you are allergic to seeds or simply prefer using nuts in your granola, feel free to swap out the sunflower seed butter with almond butter as well as the sunflower and pumpkin seeds with your favorite nuts (almonds, walnuts, cashews, pecans...). Anyways, I am done chit chatting about this granola and my love for crunchy foods. Preheat oven to 300ºF and line a baking sheet with parchment paper. Set aside. Add dates, coconut oil and sunflower seed butter to a medium saucepan heat on medium heat. Once the coconut oil and the sunflower seed butter have melted, mix and transfer to a blender. Blend until smooth. Alternatively, you can blend this mixture using an immersion blender. Set aside. To a large bowl, add the remainder of the ingredients and mix. Transfer the date-coconut-sunflower seed butter mixture onto the dry ingredients. Mix using your hands to incorporate - the mixture will be very sticky at this point. Transfer granola onto the prepared baking sheet and press down with your hands, forming a uniform layer. Bake for 15 minutes. Using a wooden spoon, toss the granola around and rotate the pan. Bake for another 15 minutes. Remove the granola from the oven and let cool completely before storing in an airtight container. Enjoy on its own as a snack, as a topping on smoothie bowls or with your favorite milk. * I used mazafati dates for this recipe, but feel free to use any dates you have on hand. If your dates are hard, make sure to soak them in boiling water for 30 minutes, drain and use in the recipe as indicated. ** Don't have date sugar? Swap it out with coconut sugar or keep this recipe sugar free by adding 1/3 cup raisins after baking.